A tornado is a violent windstorm characterized by a twisting, funnel-shaped cloud extending to the ground. Tornadoes are most often generated by thunderstorm activity (but sometimes result from hurricanes or tropical storms) when cool, dry air intersects and overrides a layer of warm, moist air forcing the warm air to rise rapidly. The damage caused by a tornado is a result of high wind velocities and wind-blown debris. According to the National Weather Service, tornado wind speeds can range between 30 to more than 300 miles per hour. They are more likely to occur during the spring and early summer months of March through June and are most likely to form in the late afternoon and early evening. Most tornadoes are a few dozen yards wide and touch down briefly, but even small, short-lived tornadoes can inflict tremendous damage. Destruction ranges from minor to catastrophic depending on the intensity, size, and duration of the storm. Structures made of light materials such as mobile homes are most susceptible to damage. Waterspouts are weak tornadoes that form over warm water and are relatively uncommon in Pennsylvania. Each year, an average of over 800 tornadoes is reported nationwide, resulting in an average of 80 deaths and 1,500 injuries (NOAA, 2002). A windstorm can occur during severe thunderstorms, winter storms, coastal storms, or tornadoes. Straight-line winds such as a downburst have the potential to cause wind gusts that exceed 100 miles per hour. 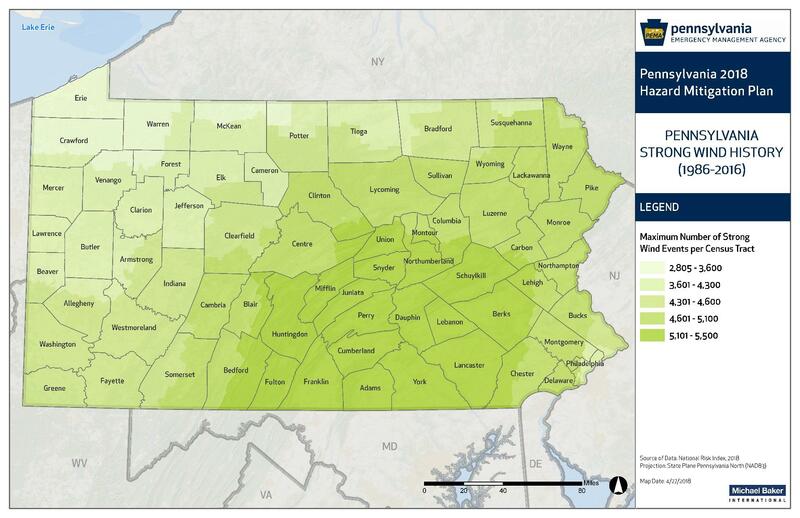 Based on 40 years of tornado history and over 100 years of hurricane history, FEMA identifies western and central Pennsylvania as being more susceptible to higher winds than eastern Pennsylvania. (FEMA, 1997). The number of recorded F3, F4, & F5 tornadoes between 1950-1998 ranges from <1 to 15 per 3,700 square mile area across Pennsylvania (FEMA, 2009). 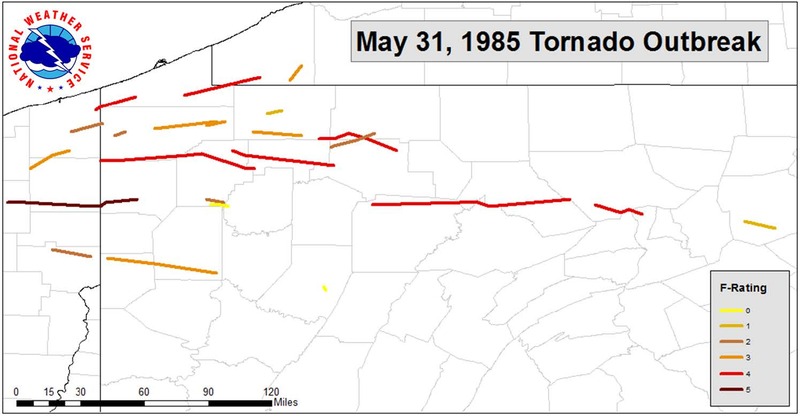 On May 31, 1985 a very rare outbreak of 43 tornadoes tracked across northwest Pennsylvania, killing 65 people, injuring 526 and causing over $378 million worth of property damage. In the United States, tornado activity has increased in variability with a general decrease in the number of days a year with activity but an increase in the number of tornados on those days (increase in tornado outbreaks). The tornado season extent is also increasing with an earlier start of the high activity season. With increases in air temperature and moisture under climate change there is higher risk of extreme convection and favorable tornado conditions (possible increase in frequency and intensity), however, this remains uncertain as confidence in past trends is low. Map showing maximum number of strong wind events per census tract in Pennsylvania from 1986-2016 (FEMA NRI, 2018).